What’s a typical day like at Bucks UTC? Your time at the UTC will closely resemble a working day beginning at 8.40am; ending at 4pm (3pm on Wednesday and Friday). We asked some of our students to write down what a normal day looks like for them from start to finish. Find out all about the UTC day from Hassan, Natalia and Aidan, using the tabs below. The day for every student at the UTC starts at 8:40. We sit in the atrium until it is time to go into the Taylor Wimpey hall for Briefing, or to one of the various departmental breakout areas. In the briefing, one of the teachers will talk about a certain topic such as what ‘Anti-Bullying’ week is or the Principal will talk about what has happened over the last week and inform everyone about any upcoming events and trips. The first lesson of the day is a BTEC building studies session which lasts from 9am until 11am. This may be either practical or theory. Some things we may do for a practical session is graphical detailing or bricklaying. From 11am, we have a 15-minute break where we can sit in the atrium or we can go into the Learning Resource Center to do some work. After break, we have GCSE English for an hour where we will study a varied selection of text from literature. We will have to write about this in our exams. As we approach ever closer to exam time, we focus on more past papers. Maths then follows from 12.15 till 1.15. As I’m a building studies student, math problems are in the context of construction to increase our understanding. This makes it much more interesting! Lunch is a much anticipated time of day where we all indulge ourselves in the food available from the small cafeteria within the UTC. Lunch is from 1:15 until 2:00pm leaving us plenty of time to get ready for the afternoon sessions. Between 2 and 3pm, we have a computer science lesson with one of the tutors where we will learn about different topics such as Binary and the Systems Life Cycle. Throughout the week, I will also have Spanish and History lessons and my two additional GCSE options. The last session we have is Plenary, where we will be taught useful skills for different situations such as exams and interviews. Within this hour, we also get talks from different externals speakers such as representatives from Taylor Wimpey. Another recent visitor was Network Rail, who came in to talk about apprenticeships and the different jobs available within the company. A typical day for me starts at around 8:30am. When I arrive at school I usually go straight to the Atrium and wait with friends before Briefing at 8:40am. Briefing usually lasts around 20 minutes and allows the teacher to talk about a chosen topic or inform us of any upcoming events or trips. Following this, I will either a have a lesson or an independent session. Independent sessions allow us to study and catch up on any assignments or projects. I like to make use of this time to complete homework. We usually have 2 hours of Independent sessions a day. Break is between 11am and 11:15am. We can either go to the Atrium and buy a snack from the canteen or sit in the classrooms or breakout rooms. Some like to go to the Learning Center to get on with work. After the break, we either have lessons or independent study sessions. As my specialism is Computing, depending on my timetable, a lot of my lessons will be in the Computing Suites. Occasionally one of the Partners from CISCO or Intel will take a lesson. These are usually my favorite as they tend to talk about current issues which I find very exciting. We have 45 minutes for Lunch between 1.15pm and 2pm. During this time, we are able to buy lunch from the canteen or alternatively we can go out and buy lunch. We are also allowed to go home, but unfortunately, I live too far away to get back in time. In the afternoon, we have 3 hours of lessons. Often in the afternoon, I will either have a study skills session or a Tutorial session. During tutorials, our tutor helps us with things like CVs and cover letters and provide support for university or apprenticeship applications. A Tutorial lesson is usually run by the Vice Principal, Sarah, and together we will go through our options for when we leave the UTC. The day usually finishes at 5pm with the exception of two days. On Tuesday we finish at 4pm and on Friday we finish at 3pm. A basic day for me at the UTC starts by getting the bus into to college. The day starts off with a morning briefing at 8:40am which is given by a teacher. They usually discuss important topics or upcoming events. After this, we have lessons which are in hour blocks. This will usually include a lesson with a building studies teacher, it may be a theory or a practical session. At 11:00am, we have a 15-minute break. As a year 12 I am allowed to go off-site, but as it’s usually raining I never go out! 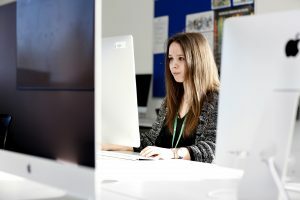 Some of our lessons are replaced by independent study sessions where can go into computer rooms and get on with assignments or homework. Lunch follows at 1:15pm. A privilege of being Year 12 and 13 is that I am allowed out to town. If I don’t fancy the food from the canteen, I will go to the local shop and get lunch from there. We then have 3 hours of lessons, independent study or enrichment after lunch, except Friday and Tuesday when we get to leave slightly early. Enrichment sessions could be sport or drawings. A few times a week I will have a study skills session, where a tutor helps you go through university applications and will prepare you for leaving The UTC.